Starwood Hotels & Resorts Worldwide, Inc. (NYSE: HOT) opened Element Harrison – Newark, the brand’s second hotel in New Jersey, on August 21, 2014. Featuring 138 stylish, sustainable rooms and a light-filled atmosphere designed to fuel a life in balance and on the move, the new Element is quickly emerging as the social hub of Harrison’s burgeoning urban lifestyle scene where business and leisure travelers, professional sports fans and locals intersect in a fun, stimulating setting. Minutes from Manhattan, Jersey City and Newark via the adjacent PATH Station and five miles from Newark International Airport, Element Harrison – Newark offers easy access to the area’s myriad cultural, recreational, dining and entertainment pursuits. When not socializing in the hotel’s welcoming lobby or outdoor patio, guests can walk to a variety of new shops and restaurants and are within proximity of Newark’s downtown business district. Sports and entertainment can be found at Harrison’s 25,000-seat soccer stadium for the NY Red Bulls professional soccer team, and the Prudential Center in Newark, which is home to the New Jersey Devils hockey team, college basketball and concerts throughout the year. 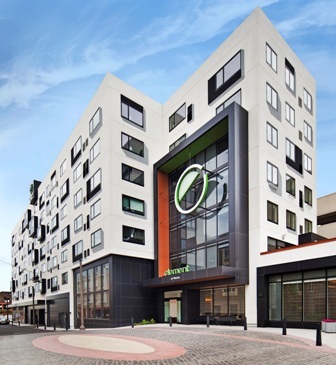 The stylish, sustainable rooms and suites at Element Harrison – Newark feature a fluid design of modular furniture, flat-screen televisions, large desks with open shelving, custom-designed closets and original artwork from local artists. Rooms will also offer fully-equipped kitchens and the signature Heavenly® Bed, and spa-inspired bathrooms will feature an invigorating rain shower and dual-flush toilet. Other brand signatures include a state-of-the-art, 24-hour fitness center, indoor pool, and a 1,500 square-foot meeting room with modular furnishings, a flexible layout and state-of-the-art technology that can be customized to meet any business or social needs. Guests can stay on the move with Element’s complimentary bikes to borrow and enjoy fun and free extras including complimentary Wi-Fi throughout the hotel, the signature RISE breakfast, RELAX evening reception, and salon bar carts stocked with premium wines and beers, soft drinks and snacks, available after hours. Element Harrison – Newark was developed by Ironstate Holdings, LLC and The Pegasus Group as part of the Partnership’s larger, mixed-use development that will ultimately comprise 2,600 luxury residential residences and 80,000 square feet of street-level retail space, the first phase of which has already been completed. A hotbed of activity and investment, Harrison is also benefitting from a $256 million upgrade of the PATH Station by the Port Authority of New York and New Jersey. Element is the first major hotel brand to mandate that all properties pursue the U.S. Green Building Council’s Leadership in Energy and Environmental Design (LEED) certification for high-performance buildings. It’s recognized as an industry leader in the eco-space, and offers travelers a fresh, reimagined interpretation of the extended stay hotel experience.